picture taken with Padre Pio. Luigi Bellora was employed as a Carabinieri (police officer) for the State Police Department in Turin, Italy. When a friend gave him a biography on the life of Padre Pio, he found it to be enlightening. Reading the book caused him to pause and think about his own life and he realized that he had been neglecting his spiritual duties for a long time. The book was the wake-up call that he needed to get his priorities ordered rightly. Luigi was able to visit Padre Pio in 1953. From that time forward, he used his vacation from work to travel to San Giovanni Rotondo so that he could be near Padre Pio. Luigi soon became a familiar face at the monastery of Our Lady of Grace. He felt blessed to make the acquaintance of many of the Capuchin priests and brothers who served in San Giovanni Rotondo. He was awed by Padre Pio and he often felt nervous as he stood in line, waiting to make his confession. On one occasion in the confessional, Padre Pio noticed that Luigi was trembling. “Why are you shaking like that? Is it because you think I am too strict?” Padre Pio asked. Padre Pio then gave him a friendly nudge as if to calm him down. On occasion, Padre Pio could be severe with Luigi in the confessional. Luigi realized that whenever this occurred, there was never a time when he did not deserve it. But even if he knew that he deserved it, it was by no means easy to endure. It had always been hard for Luigi to accept criticism gracefully and at times he reacted in an unreasonable and immature way. Luigi once had an upsetting encounter with Padre Pio and decided to leave San Giovanni Rotondo immediately without so much as saying goodbye. He paid his bill at the guest house and went directly to the bus stop with his suitcase in hand. Although the bus made a regular stop there each and every day, for some reason on that particular day, it passed right by Luigi without even pausing. Luigi had no choice but to walk back to the guest house and get his room back. Luigi could not seem to shake his feelings of hurt and resentment. He reasoned that even though he was still in San Giovanni Rotondo, under no circumstances would he attend Padre Pio’s Mass. The next morning as he was lying in bed, he suddenly felt what he described as a “hard blow” to his shoulder. He quickly got up and turned on the light even though he knew that he was alone in the room. He recalled that Padre Pio sometimes worked in mysterious ways and the thought occurred to him that the punch to his shoulder might have come from Padre Pio. “Perhaps he is trying to knock some sense into me,” Luigi said to himself. Later a priest who was staying at the same guest house spoke to Luigi and convinced him to go to Mass. That very day, Luigi spoke to Padre Pio and apologized to him. “My son, that is all in the past,” Padre Pio said. Let us bury it and never think of it again.” Luigi was able to put the matter completely behind him. Luigi counted himself very fortunate to be able to spend all of his holidays and vacation days in San Giovanni Rotondo. He had a great desire to be of service to Padre Pio and the other Capuchins during his visits. The superior, Father Carmelo de Sessano, noticed his helpful attitude. One day he asked Luigi if he would consider having a “working vacation.” He explained that he was trying to find a volunteer to stand guard near Padre Pio’s cell door in order to prevent people from disturbing him. Since Luigi was someone that Father Carmelo and the other Capuchins knew and trusted, and since he worked on the police force, he seemed to be the perfect choice. At the time, Padre Pio was weak and ill and his fellow Capuchins were very concerned about him. In his fragile state of health, it was important for him to get his rest. Some people, often complete strangers, had the audacity to sneak into the monks’ private quarters and walk into Padre Pio’s cell unannounced. Padre Pio needed to be protected from such people. “There is nothing that I would like better than to assist Padre Pio in this way,” Luigi said to Father Carmelo. Every day the routine was the same. Luigi entered the monastery through a hidden door that was semi-obstructed by builders’ planks. The arrangement worked out perfectly and no one in the church ever noticed what Luigi was doing. If they had, he would have been swamped with requests, messages, letters, and gifts to give Padre Pio. Each morning when Luigi arrived on duty, he greeted Padre Pio in his cell. Padre Pio would respond in a feeble voice as his illness had debilitated him to a great extent. Luigi would then make his way to the wicker chair that was set up for him in the corridor. People managed to enter the private area from time to time but Luigi was always there to send them back. 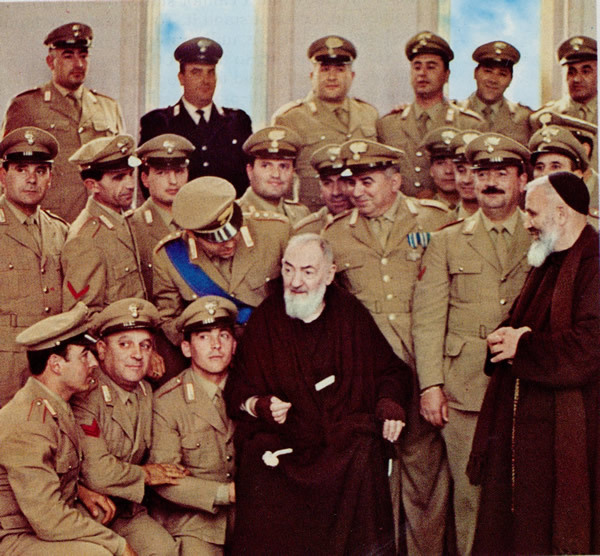 Luigi loved his volunteer position as Padre Pio’s “special guardian” and realized that the job had more perks and benefits than he had ever imagined. Often when Father Giustino and Padre Pio were having their morning coffee together in Padre Pio’s cell, they would invite Luigi to join them. Luigi noticed that Padre Pio would never take more than a few sips. Luigi would always make sure he used the same cup that Padre Pio drank his coffee from. The doctors also had a boiled egg prepared for Padre Pio every morning, but he couldn’t manage to eat it. When he gave it to Luigi, Luigi was happy to finish it off for him. Each day a doctor from the Home for the Relief of Suffering brought Padre Pio some jelly fortified with vitamins. “Luigi, would you please help me with this? I don’t feel like eating it,” Padre Pio would say and Luigi was glad to oblige. Almost every afternoon, Luigi brought Padre Pio an ice-cold bottle of beer. “But how can you do this?” Padre Pio asked. “How can you afford to get this for me?” “I do this with all my devotion to you,” Luigi replied. Luigi also agreed to help with some of the overflow of correspondence that came into the monastery. On one occasion, Padre Pio spoke to Luigi about the particulars of a letter that had been received. “Luigi, tell the person in question that if he changes his lawyer, everything will turn out all right.” Luigi later learned that the person took Padre Pio’s advice and changed his lawyer, which resulted in a positive outcome. From time to time throughout the day, Luigi opened the door of Padre Pio’s cell to see if he needed anything. Whenever he did so, he found that Padre Pio was praying. Sometimes Luigi saw him gazing at the beautiful painting of Our Lady of Purity that hung on his cell wall. Once when Luigi opened the door, Padre Pio was whispering to the beautiful image of the Madonna. Through the years, Luigi continued to visit Padre Pio, sometimes for longer, sometimes for shorter stays. Padre Pio called him affectionately, “Dear Luigi.” “But you are the one who is dear,” Luigi would reply. He also asked Padre Pio to assist him as well as his family at the time of death. “Yes, I will do so but you must be worthy of this,” he replied. One day Luigi spoke to Padre Pio and asked him for a spiritual thought, not only for himself, but for all the members of his family. “Always live under the watchful gaze of God,” Padre Pio said to him. Luigi handed Padre Pio a paper and asked him to write the words down and he was happy to do so. Luigi kept the written words of Padre Pio as one of his most treasured possessions. In the spring of 1946, Maria Silvana Benedetti and her husband Almiro moved from Rome to Miramare di Rimini to the home of Maria’s father, Agusto. Maria and her husband followed the moving van full of furniture in an open car for a distance of 200 miles. The long drive in the open air evidently had serious consequences for Maria because shortly after, she came down with double pneumonia. She developed a very high fever and her body became as she described it, “a heavy, lifeless burden.” Twenty days passed and her condition did not improve. Two nuns from the local convent came to Maria’s bedside and prayed for her. Her two-year-old son Claudio stayed close by her side. As the days passed, Maria drifted in and out of consciousness. Every so often she opened her eyes to see people gathered around her bed. Later, she learned that they were praying the novena to Padre Pio for her recovery. One afternoon she had a glimmer of clarity and pointed to a Rosary that was hanging from the chest of drawers. Her husband Almiro, shaken but happy, put it into her hand, and trying to make her understand, continued to repeat to her, “Maria, this is the little Rosary which Uncle Peppino took to Padre Pio and had him bless!” Maria slowly opened her hand to look at the Rosary and was invaded by a strong perfume of violets and vanilla. She felt her bodily strength returning. The scent of vanilla persisted and everyone in the house noticed it. Maria asked her mother, Ernesta, if she was making cakes but she said she was not. Maria did not know at the time that Padre Pio sometimes communicated his presence through a very pleasing fragrance. She asked for something to drink and was given some broth. As the hours passed, she felt stronger and stronger. That evening she was able to sit up and speak to her visitors. In those days, Miramare was a very small town. “I can say that almost all of Miramare’s inhabitants were in my home to see the miracle that had occurred,” Maria said. They all prayed and gave thanks together for the healing Maria had received through the intercession of Padre Pio. Seventy-year-old Severino Naldi who lived in Forlimpopoli, Italy had been wheelchair bound for seven years. Even though he knew he would never walk again, he still had many things to be thankful for in his life. He felt especially grateful to have a wonderful wife who loved him dearly. Severino had heard many impressive things about Padre Pio and decided to write a letter to him. He sent the letter on December 8, 1952 on the feast of the Immaculate Conception. In the letter, he asked Padre Pio, not for a healing of his paralysis, but instead, for spiritual help. Two days after mailing the letter, Severino felt something deep within that he could neither describe nor fully understand. On January 16th, Severino paid a visit to his young nephew. Severino greeted him lovingly and as he reached to kiss his nephew’s hand, for some reason, he thought of Padre Pio’s wounded hands. He remembered that Padre Pio always wore half-gloves in order to hide his stigmata. At that moment, he was able to rise from his wheelchair and walk. He never had to use a wheelchair again. For a long time, Ida Giusti suffered from terrible pain which had immobilized her right arm. She could neither work nor sleep and the pain intensified whenever she tried to rest in bed. She lost her appetite and became weaker with each passing day. The remedies prescribed by her doctor were totally ineffective and she finally became desperate. She had a family to look after and was at the point where she could do almost nothing. A friend gave Ida a picture of Padre Pio and advised her to visit him at his monastery in San Giovanni Rotondo. The year was 1948. Even though it was more than 560 miles from her home, Ida realized that the trip would be well worth it if she could somehow be helped. She invited two friends who were also burdened with many problems to go with her. On the way to San Giovanni Rotondo, there was a mix up and because of it, the three women had to spend the night in San Marco in Lamis. That night, to Ida’s great surprise, she found that she was able to rest comfortably in bed. Her companions were also surprised at the improvement in her condition. At the monastery of Our Lady of Grace, Ida was able to make her confession to Padre Pio. His presence had a calming effect on her and when she finished her confession he said to her, “Go, for from me you have no more need of anything.” She kissed his hand and left the confessional and the emotion of that brief encounter stayed with her for the entire day. On the trip back home, Ida found that she was able to carry her suitcase with no difficulty. When she arrived at her home, she was free of pain. Her arm was completely healed and she gained back all of her physical strength. 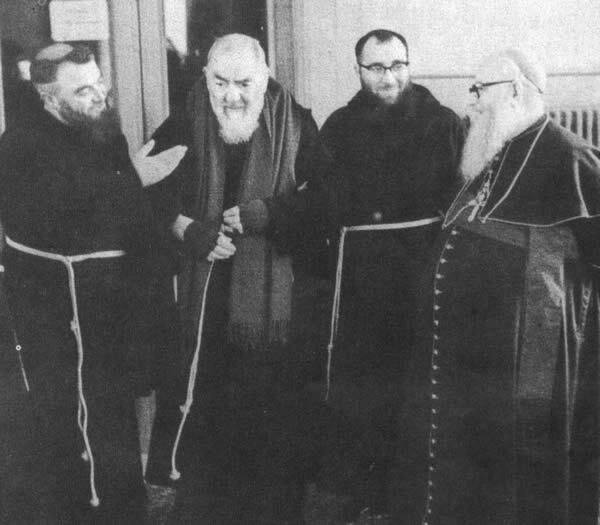 A Missionary Bishop (far right) visiting Padre Pio. When Father Lazzaro returned to Central America, he wanted to tell his friends and associates all he had learned about Padre Pio. He spoke about Padre Pio to the Franciscan seminarians who were studying in Planes de Renderos, San Salvador and it was there that many great graces came. When he was transferred to the parish of St. Francis in San Miguel, he made Padre Pio known there as well. He saw that on more than one occasion, Padre Pio’s intercession was asked for and received. Later, he was transferred to the large parish of Momostenango in Central Guatemala. He was the only priest to serve fifty thousand Catholics in an area that encompassed two hundred and fifty square miles. Just like he had done in the past, Father Lazzaro continued to spread the message of Padre Pio. One of the women in the area, Emilia, gave birth to her seventh child, who was to be named after his father. The baby was healthy but complications soon set in for Emilia. A nursing Sister was summoned since there were no doctors in the area. The Sister saw how grave Emilia’s condition was and called for Father Lazzaro to come quickly. Seeing that Emilia was at death’s door, Father Lazzaro gave her the Last Rites and told her to pray and to invoke Padre Pio. Everything was in order to transport Emilia to the hospital which was a one hour’s journey by car over a very bad road. Father Lazzaro asked the nursing Sister to wait ten minutes more, the time he needed to go and get a picture of Padre Pio so that he could give it to Emilia. Realizing the importance of getting Emilia to the hospital as soon as possible, it was with great reluctance that the Sister agreed to give Father Lazzaro the extra ten minutes. He soon returned and put the picture of Padre Pio in Emilia’s hand and she held it tight. He learned that she held on to it until the doctors took it away from her when it was time for her surgery. To the amazement of the physicians who attended her, Emilia recovered from her life-threatening illness. She returned to her family and to her regular duties, enjoying good health from that time forward. Divine Providence had been watching over Emilia from the beginning, she was certain of it. Her seventh child was not named after his father as intended, but was named Pio, in thanksgiving to Padre Pio. 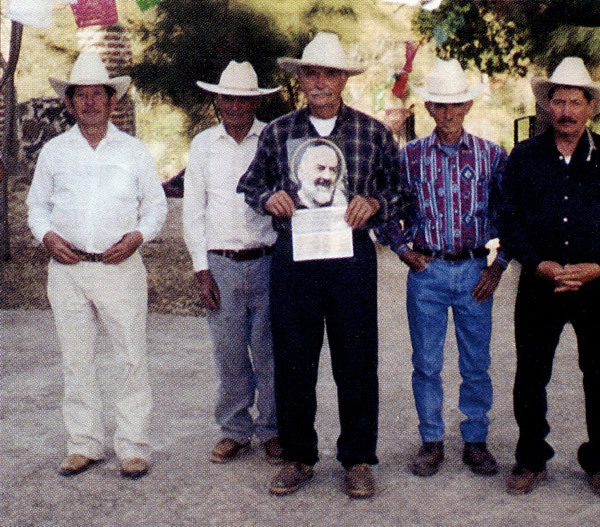 A photo of some of the members of the Padre Pio Prayer Group in Rancho del Chamacuero, Mexico. The following testimonies were submitted on our Padre Pio Devotions website: www.padrepiodevotions.org Simply click on the “Testimonials” link on the website if you have a testimony to share. Somewhere Inside his Mind, He was Still There My daughter and I were praying for a young friend, Michael, who attempted to take his own life. After a few days in a coma, Michael had little brain function according to his doctor. We prayed for Michael in the IC Unit. He squeezed our hands when we prayed. He did things that showed us that somewhere inside his mind, he was still there. His grandfather is a Protestant pastor, and he prayed with us. Michael was then moved to a nursing care facility to die. I got the biography of Padre Pio and read it to him at each visit. We continued to pray for him. Instead of getting worse, he stayed the same for two weeks and then a terrible infection sent him to the hospital again. It was then that the doctor finally believed that Michael was truly there behind the facade of a “lost soul.” The days passed and Michael became more alert and then on to therapy and the rest is history–he drives and works today. God is Good! Joanna, Where are You Going? While assisting the homeless, I met a woman named Joanna. She had been living on the streets for seven years. Each day I would take Joanna food and money. Joanna was a Catholic. As the winter months became brutally cold, Joanna mentioned to me that she was unsure as to whether she could handle another cold winter sleeping on the sidewalk. I ask Joanna if she knew who Padre Pio was. She said she had heard of him, but knew very little about him. I told Joanna that I was going home to light a candle near my Padre Pio statue and that I would have a long talk with Padre Pio about her situation. Which I did. The next time I went to see Joanna, she was putting all her belongings in an old car. I said, “Joanna, where are you going?” She said, “I am not going anywhere. A nice lady donated this old car to me and now I have a warm place to sleep.” I knew right then and there that Padre Pio had answered my prayers. I Had no Desire to Use Drugs Again I had a very bad drug problem and had no desire to stop using. My Aunt went to a Padre Pio Celebration and prayed to him for me. I woke up one morning and had no desire to use drugs again. That was 11 years ago. I pray to St. Pio and thank him every day for my miracle. I know I am his spiritual child. How does a lamp burn? Through the continuous input of small drops of oil. If the drops of oil run out, the light of the lamp will cease, and the bridegroom will say, “I do not know you” (Mt. 25:1-13). What are these drops of oil in our lamps? They are the small things of daily life: faithfulness, punctuality, small words of kindness, a thought for others, our way of being silent. . . These are the true drops of love that keep your religious life burning like a lively flame. Do not look for Jesus away from yourselves. He is not out there. He is in you. Keep your lamp burning, and you will recognize him.